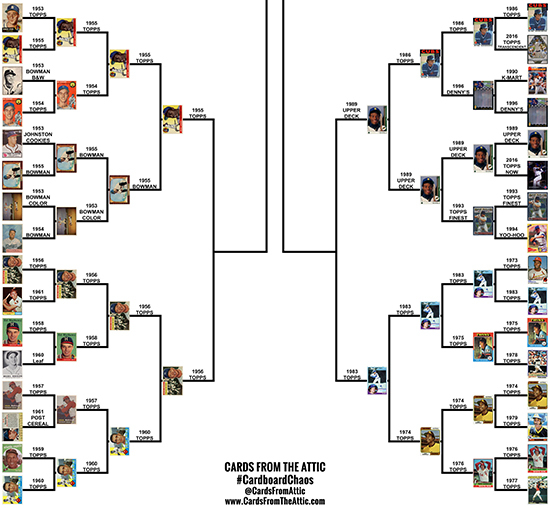 If you are a fan of baseball cards and spend time on Twitter in particular, you’ve probably seen what Cards from the Attic is doing with regard to their #CardboardChaos bracket event. They have very skillfully pulled some of the greatest baseball card sets of all-time, ranked them and seeded them in a bracket format. Then they are asking their legion of fans to vote on their favorites. Make sure to check out the fun at cardsfromtheattic.com! Just like the college basketball tournament, this is a win or go home scenario with different sets moving on until one is crowned the #CardboardChaos champion. 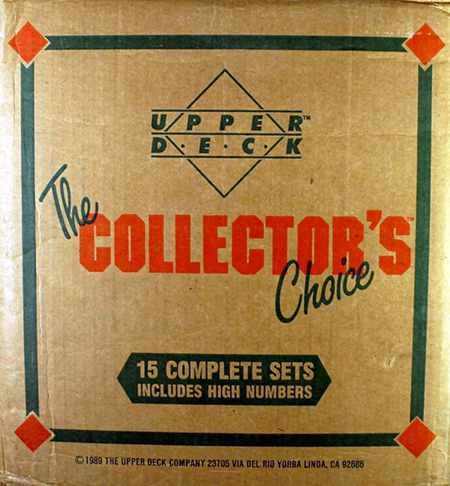 Upper Deck only has one set in the tournament as it is primarily geared to vintage sets, but maybe one set is all the company needs. The classic 1989 Upper Deck baseball set has marched to the semi-finals and with a little luck and fan support, there is a shot it could take the title. UD: We’ve talked about doing something like this, but it is really a daunting task. How did you come up with it and how hard was it to put together? KM: “Like you guys, I have been toying with the idea for some time. 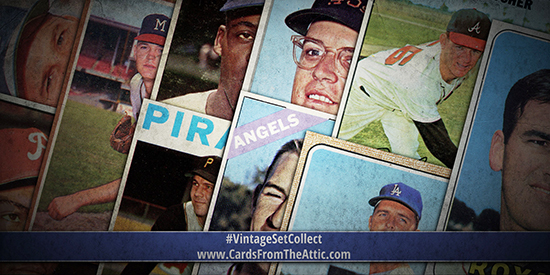 I was finishing up my #VintageSetCollect campaign and tossed out the idea of doing a bracket to go along with the tournament coming up. Collectors were very responsive to the idea. Why wouldn’t they be though? Collectors are a crazy bunch. They cherish their cards and are passionate about them. “I posted several threads keeping collectors updated and encouraging their input. I wanted everyone to feel like we were creating the tournament together. Everyone was helpful with tournament ideas, set recommendations and helping spread the idea to fellow collectors. “Once the idea was floating around, everything started to fall into place. For example, I posted something about not referring to the tournament as “March Madness” because of the trademark situation and @twzig simply posted “CardboardChaos.” Little did he know he just hit a Kyle Schwarber scoreboard shot! Instantly, I knew he was on to something. I didn’t even bother brainstorming any other possibilities. It was perfect. “Putting the tournament together has been relatively easy. I have always worked with technology, but over the last decade my main focus has been directed towards digital media and marketing. Creating the main bracket was the most tedious part of the project. I would say I worked on that for around 10-15 hours. 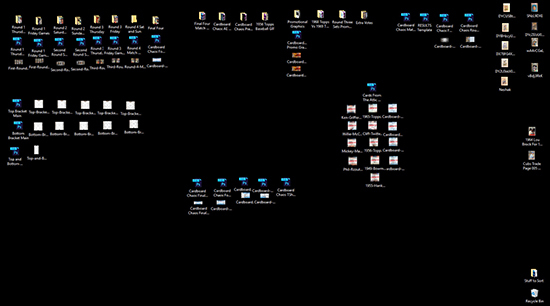 Kevin keeps his desktop pretty organized so he can quickly access images he needs to promote the tournament. UD: One of the parts of college basketball tournament that people really love is talking about who got snubbed. Which sets did you hear fans talk about that should have been in and how did you respond? KM: “1983 Topps. Next question. No, seriously. Collectors were basically demanding 1983 Topps makes the tournament or they were going to bike spoke every #MikeMantle card that I have in my collection. Not sure why, but they were going crazy for that set to get in. To me, it was on the bubble, I wasn’t even going to put it in there. Personally, I was too worried about trying to find a way to sneak 1986 Topps in the back door. UD: One of the reasons we haven’t done this ourselves is because you run the risk of alienating fans tremendously with the seeding of sets. Seed a set to low and people will say you are manipulating the brackets. Seed a set too high and you lose your credibility. What type of responses did you get from seeding? KM: “I enjoy alienating fans. That’s what has made #CardboardChaos great is the discussions it has stimulated between collectors. “As I was creating the main bracket, the thought of seeding these sets was slightly overwhelming. At one point, I thought about randomly putting the cards into the bracket. Lucky for me, lots of collectors have been willing to toss out some ideas that I have been able to run with. @ThatSportsGuy50 had a great idea. He proposed to set the bracket up by era. Having sets compete with other sets from similar time periods would add excitement to the early rounds of the tournament. I thought it was a great solution, and for the most part has played out well. “There have been a few match-ups that would have been better in the later rounds, no question. If I would have looked ahead, I could have flipped the 1952 Topps region, most likely making the T206 Vs 1952 Topps match-up happen in the #FourFinal round this weekend. The match up had almost 300 votes ending in a 51% to 49% victory for 1952 Topps. “There have also been some incredible match-ups early, and it seems like round after round the excitement continues to build. I mean 1952 Vs 1956 Topps is a legendary match-up, and 1989 Upper Deck against a popular 1965 Topps vintage set will be intriguing as well. 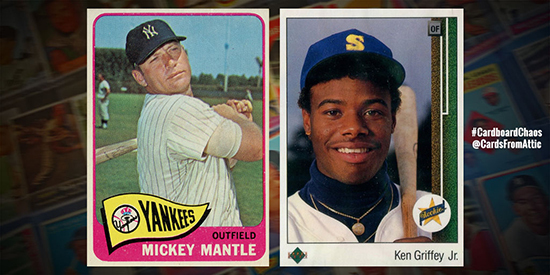 If 1952 Topps Vs 1989 Upper Deck meet in the championship, I think the bracket set up did its job. UD: The 1989 Upper Deck Baseball release isn’t traditionally considered a vintage set, but people forget it is almost 30 years old. Was there any negativity about having it included to compete with sets that released decades earlier? UD: The 1989 Upper Deck Baseball set has performed really well in the tournament and made it to the semi-finals. What do you attribute that to and do you think it could take the championship? KM: “Ken Griffey Jr. Rookie Card. Next question. Seriously though, we know why the set got in. We know why the set is dominating. Now for some of the lesser known reasons. Card stock. When it came out, it could bend a bike spoke, that is how heavy duty these cards were. That is the real deal. Speaking of the real deal, I am pretty sure there was a little hologram thingy on each card, you know that little shiny thing that blew everyone away. You know, one of the first modern gimmicks of the industry. I mean marketing ploy. I mean cool addition for the future of cards! I’m just goofing off. Insert smiley emoji here. I heart you guys for all you have done for the #CardboardChaos tournament. UD: As we shared the Cardboard Chaos tournament is down to the semi-finals. When and how do fans vote for the last round? 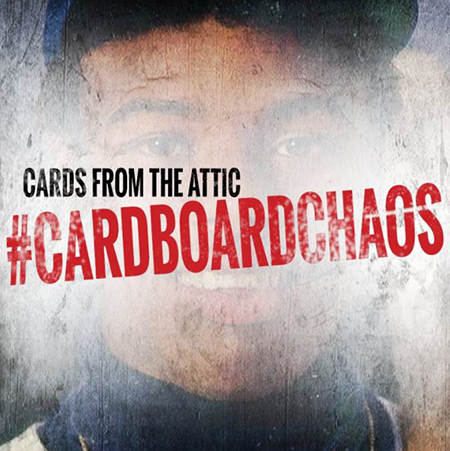 KM: “The entire #CardboardChaos tournament is taking place on the Cards From The Attic Twitter page. Voting resumes on Saturday when the basketball games tip off. Fans can vote for each match up using the poll attached to each graphic. The voting for the #FourFinal will run for 24 hours, then the votes will be finalized. The championship match-up will run for 48 hours, then the vote will be finalized. UD: What else should people know about Cards from the Attic and what you all do on the site? And for those of you who are carefully considering your vote, let me just say this as a fan and trading card enthusiast (who may be a bit biased for the 89 Upper Deck Set). It’s 1989 Upper Deck Baseball! Game-changer! White card stock! Color photography on both sides! Anti-counterfeiting hologram! Foil wrapped to prevent tampering and pack searching! Random sequencing to improve collation! Exceptional photography! Ken Griffey Jr. leads off the set! Reverse negative errors! Ken Griffey Jr. purple hat error. Nolan Ryan with a football! Made just for collectors from listening to collectors! It’s the “Collector’s Choice” and we hope you will make it your choice when you hit the polls this week! 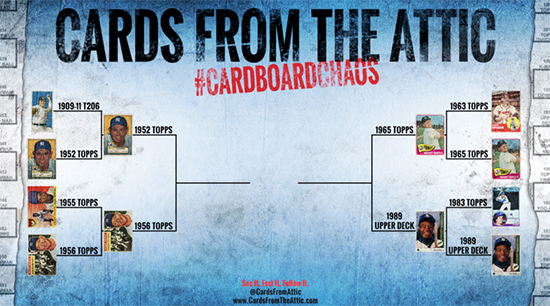 Vote UD in the #CardboardChaos tournament! Great stuff there. I’ve stayed with #CardboardChaos since day 1. Has been a blast. Happy ‘89 UD has made it this far. Beat out stiff competition.